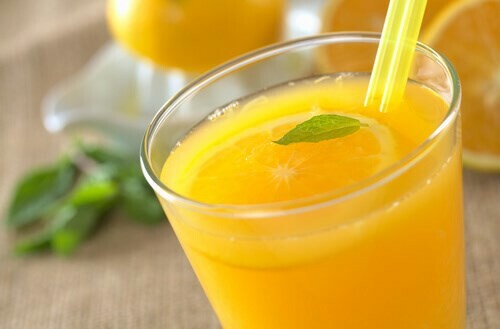 Orange juice is rich in citrates, which can prevent the formation of kidney stones. This juice also contains flavanoids like hesperidina, which has the ability to reduce the risk of having a heart attack up to 19%. So, you can imagine that there are many benefits of drinking orange juice everyday. Natural orange juice can reduce the levels of “bad” cholesterol, as well as blood pressure, preventing cardiovascular problems as a result. Likewise, it is a source rich in vitamin C, which is perfect for preventing colds. It can also help you have a perfect intestinal process, which allows you to conserve the route. When you drink this juice first thing in the morning, it will make you feel full of energy and be in a very good mood the rest of the day. – Pure orange juice, when drank on an empty stomach, is excellent for purifying the body because it helps you eliminate waste and improves intestinal movement. – When you drink orange juice everyday. the possibilities of suffering from obesity is reduced by at least 14%. Orange juice has the ability to regulate the function of the intestines. Drinking orange juice diluted in water greatly helps improve poor digestion problems because it helps eliminate residue that cause this disorder. Orange juice has great alkalizing properties, which is very favorable for helping clean your blood because it dissolves acids and prevent those that stay in your kidneys and form kidney stones. When uric acid is deposited in the joints of people that suffer from gout or arthritis, it produces a lot of pain. Drinking orange juice everyday will eliminate this component and the situation of those people will greatly improve. Orange juice is recommended for Type II Diabetes patients because it has little sugar and has diuretic properties, which can help regulate excess sugar in your body. Also, the content of vitamin C helps those patients minimize the consequences that can bring this disease, which can be infections, the difficult to form scars, or visual problems. Due to the antioxidant problems that orange has, it is a very effective treatment agains the effects of free radicals. 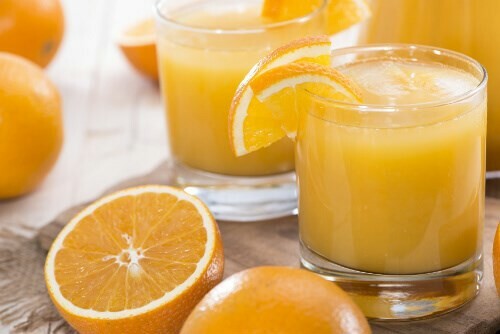 Orange juice when drank often and regularly can help reverse the effects of the passing of years that affect the body. Orange juice helps improve blood circulation, avoiding the formation of clots, and therefore can prevent arteriosclerosis. By improving blood circulation, it produces a significant reduction of high blood pressure or hypertension. This is proven by vitamin C can help prevent deafness. Vitamin C can help prevent the formation of cataracts and other eye diseases that can cause vision loss. Vitamin C has a huge importance in cancer-prevention treatments. This, like all foods, should be drank in moderation, at least until you provee that it won’t cause any reaction that may be harmful to your health as can be allergies or intestinal problems. There are some people that have to control their consumption of orange juice because if they drink a lot of it, it can cause skin outbreaks or migraines. This will depend on the level of tolerance of each person.